Constance Jeans might be the most successful female swimmer from Nottingham that you have not heard of. We know that Rebecca Adlington trained around here, but a hundred years before, Connie Jeans was training at Portland Baths in the run up to national ASA Championships, eventually competing in the 1920 and 1924 Olympic games. Her swimming career had started before the First World War when she won the Midland District 100 yards freestyle in 1913 repeating her victory through the war years until 1919 by which time she held all the British records from 150 yards to 500 yards. One of four swimming sisters , all educated at Huntington Street School , who swam for Nottingham Ladies S.C. Connie was very unassuming and never got over excited before the big races. Her oldest sister Ivy was Nottingham county 100 yard freestyle champion for several years before Connie. A slim 8stone 1lbs for her 5ft 4ins height she became a pupil teacher bursar at the age of sixteen. Connie never married , worked as a school teacher and is remembered in the ‘Jeans Trophy’ presented to the winner of the A.S.A. ladies 100m. backstroke at the summer Nationals where she had won 12 titles. In addition to her national titles ( 100 yards free 6 times , 220 yards free 4 times , Long distance twice ) she created world records at 220 , 300 yards , 440 yards and 500 yards free between 1915 and 1919. Connie’s career coincided with the Representation of the People Act of 1918 that led to women getting the vote. These days we take it for granted that girls can train just as hard as boys, but this was not always the prevailing view. At the 2018 Nottinghamshire County Championships, this trophy sat quietly on a table by the door. Connie’s name, and sister Ivy too, still adorns the cup. 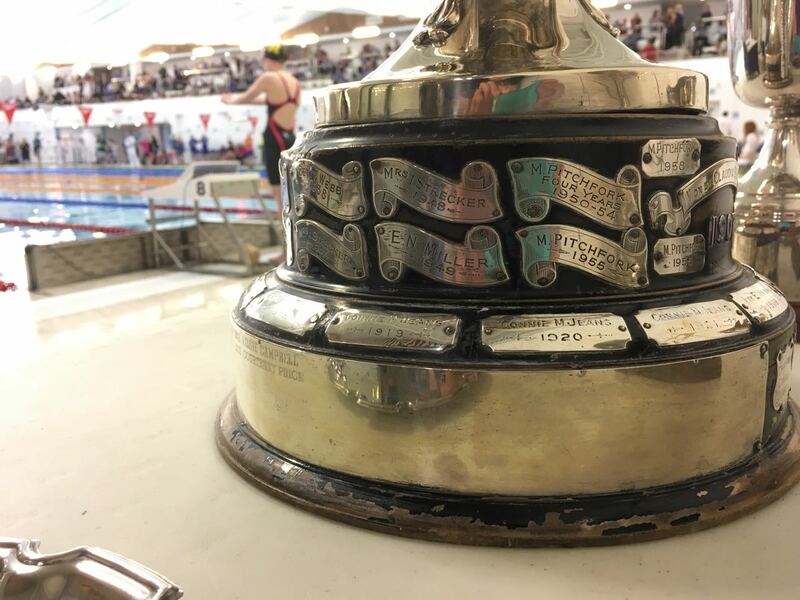 So if you are at the Counties next year and you see this trophy, give it a tap and a thank Constance for smoothing the path of girls for the next hundred years. She died in 1984, aged 84.